Are you searching for ways and means to make your windows spotless once more? Would you like to know how to skip unpleasant tasks like window washing without lifting a finger? You have chosen the right assistance – the experts of window cleaning in Kingsland will deal with this matter in short time. Your windows along with their frames and sills will look amazing, we ensure that! You will no longer have to sacrifice your leisure time – the results of our work will fully satisfy you. Our services merge highest quality with reasonable price rates, so don't wait – book now to save time, effort and money! We also provide our professional services in nearby areas: Canonbury, Pentonville, Essex Road, Newington Green, Balls Pond Road. You can always count on our workmanship and devotion for private and business window cleaning. Our experience allows us to clean all kinds of glass surfaces you could possibly have at your property. For example, you can book cleaning of small or double windows, sash ones, French doors, patio doors and bay windows. In addition, we include conservatories and roof windows as part of our practice. So to speak, you can fully enjoy the good look of your windows with our swift and trustworthy services. With our experience and workmanship, the good look of your property will be noticeable immediately – the experts of commercial window cleaning will achieve this. 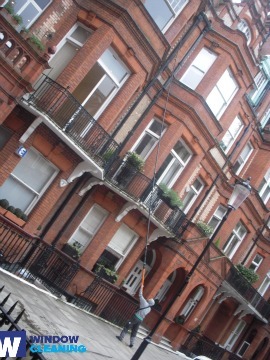 We employ water-fed extension pole system for speedy and well organised window cleaning, up to the fourth floor. For high-rise office buildings, we use the latest rope access techniques. With these appliances, we are prepared reach the highest glass panes, even on the skyscraper-sized buildings London is known for. From small shops to towering business edifices, we assure you second-to-none services – take advantage, now! We provide high quality window cleaning by using next-generation equipment. We provide perfect and spotless look for your glass surfaces, roof windows and greenhouses with water-fed extension pole system and jet washing. The poles we use are connected to water supply in our vans, thus excluding the risk of damage to the exterior of your home or business premise. In addition, we use totally safe rope access techniques to clean glasses on tall buildings. You can benefit from these methods now – give us a call on 020 3746 3113! With our quick and excellent residential window cleaning in Kingsland, you will enhance the look of your home instantly. We utilise purified water for inside and outside cleaning of your windows. We make this possible by standing on the ground with the help of water-fed extension pole system, which is safe both for your property and the cleaners. Discover more – contact us on 020 3746 3113 or complete our online booking form. You can also use our chat option. Our operators are active 24/7 – you will get answers to your questions. You can be one of our content customers now!